We have had variable weather for the past couple of weeks, a little rain, some clearing, breezy and chilly. I read that other parts of the country have been sweltering, but not here. The Pacific Ocean nearby is our year-around air conditioner. Yesterday, the sun came out in full force. In these parts we take advantage of that whenever possible. I decided to see what was happening at March's Point. The major features of this peninsula are two oil refineries. They occupy about half the land area. When driving onto Fidalgo Island via State Road 20, the distillation towers can be seen on the right. At night, they are lit up and it looks like Christmas. The sparkling light show sometimes includes flaming torches when they burn off gases. The point is also host to a large Great Blue Heron rookery that contains around 400 nests. This spot is protected and off-limits to visitors. A live "Heron Cam" sometimes shows activity in the rookery. The herons I see grazing the eel grass beds in front of my house are probably members of this colony. Above, Mount Baker stands watch over Padilla Bay which we have seen here before. A Canada Goose lazes in the outgoing tide. The bay is a protected Estuarine Research Reserve. March's Point Road runs around the perimeter of the point. There are a few spots where the visitor can pull off to enjoy the sights, view wildlife and take pictures. Padilla Bay is on the east side of the point and Fidalgo Bay is on the west side. 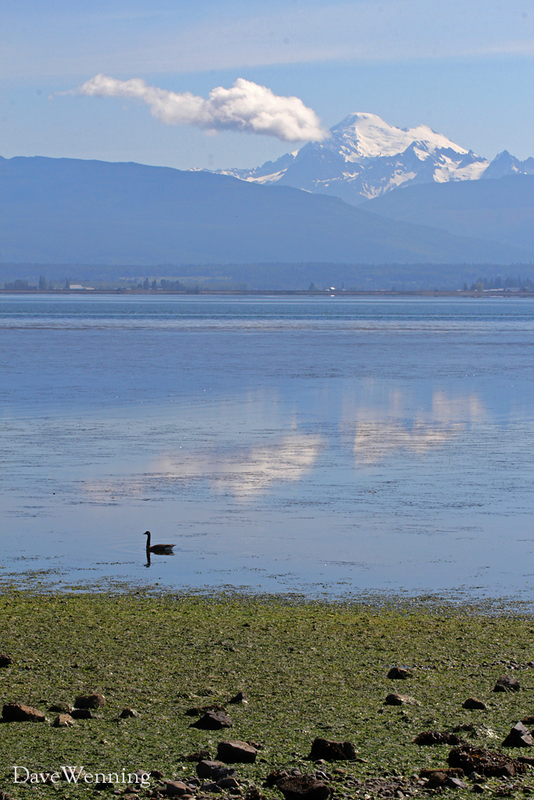 Fidalgo Bay is also a protected wildlife reserve (.pdf). 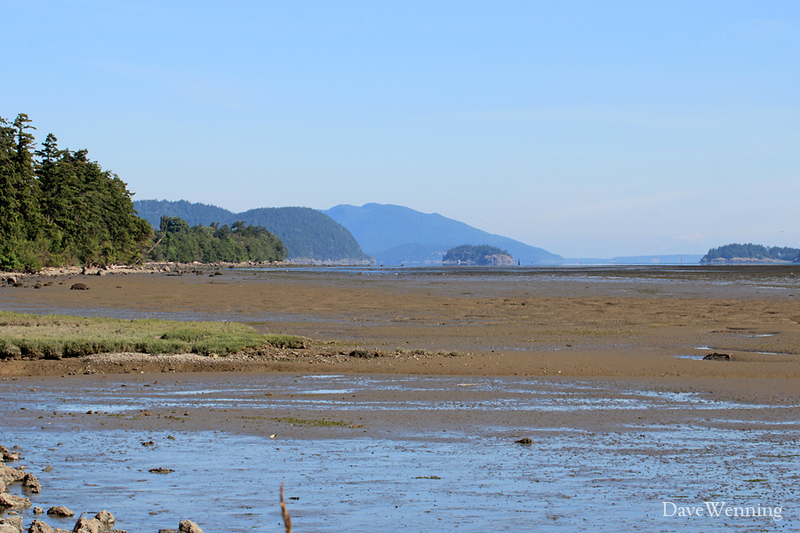 During low tides, Padilla Bay is almost completely drained. In the photo background, left to right, the closer islands are Guemes, Hat and Samish. In the center, I believe that is Lummi Island off Bellingham, Washington in the distance. 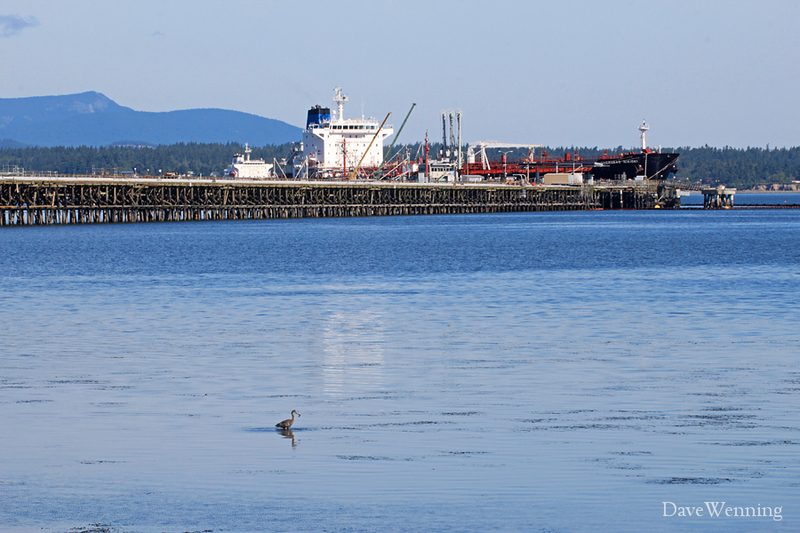 A Great Blue Heron bags a meal while Alaskan crude is delivered to the refineries. Two long piers provide for off-loading liquid fossil cargo. The ship in the photo at this pier is the Overseas Nikiski. I believe that Valdez, Alaska is the source of the petroleum delivered to the Anacortes refineries. There are many signs near the piers warning visitors from stopping, standing or parking "in the interests of Homeland Security." Where parking is permitted, I did not see any prohibitions against taking photos. Where I took this shot, there is a tank farm behind me. The tanks are enormous, too close and too large for photos. Heavy industry in the midst of sensitive, protected wildlife areas is an interesting dichotomy on March's Point. There were no petroleum or chemical odors that I could detect. The beaches and waters appear to be pristine. I have the impression that these refineries take this seriously. Let's hope this will always be the case.